Boost Your ROI and Corn Yields with SUL4R-PLUS® Fertilizer! SUL4R-PLUS, LLC manufactures product solutions that provide the secondary and micronutrients needed for healthier, better yielding crops, including corn. SUL4R-PLUS® fertilizer has revolutionized the application of Sulfur, Calcium and micronutrients. SUL4R-PLUS fertilizer, comprised of 21% Calcium and 17% Sulfate, is an innovative granular calcium sulfate proven to improve plant health and increase crop yields. In addition to the two vital nutrients Calcium and Sulfate; we have products that also incorporate 1.5% Boron or 3% Zinc or a combination of 0.5% Boron & 1.5% Zinc. 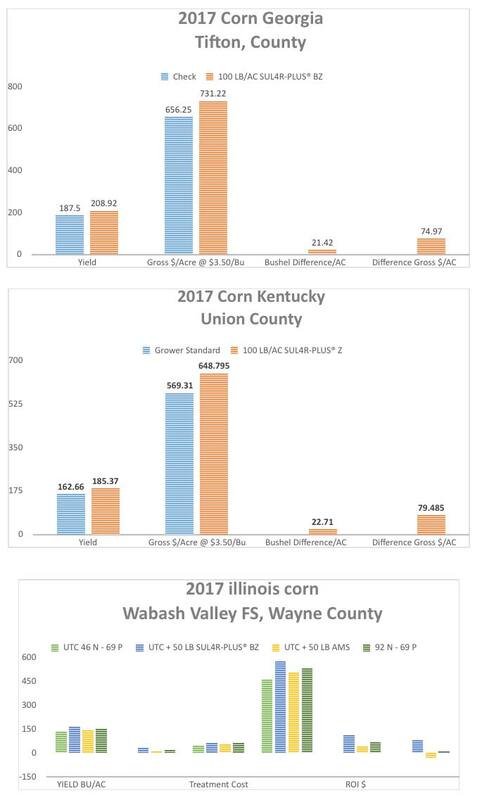 Please see the below results from some 2017 trials on corn with SUL4R-PLUS® products SUL4R-PLUS® B+Z and SUL4R-PLUS® Zinc. Call a SUL4R-PLUS sales rep today or visit www.SUL4R-PLUS.com for more information. Does Your Alfalfa Need Boron?